The title may be referencing a Grimm’s Fairytale called The Girl Without Hands. It could also just be about a girl without arms. I don’t know. It doesn’t seem integral to enjoying the work or attempting to understand it. The work is a trip, an experience more than a message, a system that works by itself. I’m going to quote a lot and talk a little. Shimoda interrupts himself. The syntax is complicated in GWA. It’s like the syntax itself is surreal. The many voices sometimes sound mid-sentence, mid-conversation, perhaps overheard. The words are mashed up and mixed together with impossible situations and small haiku moments. 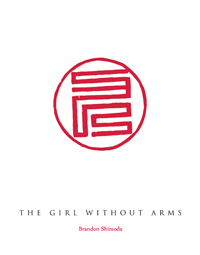 Sometimes The Girl Without Arms feels like a poetry devoid of people. Like it sprung from the earth elementally, without being crafted by anyone or like it’s what’s left after all the people are gone. Sometimes it feels austere and lonely. There is a kind of transcendence in the small, the slightly off diction, the twisted cadences and syntax. In some sections it’s as if the people that might exist are so minimal as to be hard to notice. The little ecologies of Shimoda’s short unpredictable stanzas are aesthetically charged and abstract; they are essential tiny interrelated linguistic artifacts that seem to stand independent of time or context. Shimoda’s words tend to connote more than denote. Which I think is about an object’s ability to persist beyond the ability of anything to effect or affect it. The touch only makes possible the incomprehensible. The touched becomes the monster by being untouched or by being touched and simply remaining. Go to Missoula I suggested. Yourself and the seeing fires become conflated. The world obscures the concept of the self throughout the strangeness of the book. The You and the I are confused placeholders signifying a situation in an equation that’s always more complicated. Leif Haven‘s most recent work, a collection of Craigslist erasures called Japanese Red Leaf Maple, is available free online from Love Symbol Press.